Carcar, Cebu is known for a lot of things from having the most gifted artists in the nation, along with having the best delicacies ever to reach your taste buds. You may know it for its amazing chicarons (pork rines) but it is also known for its sweet, sweet ampao. Of course, I bet Rachael Ray would choke into guessing as to how this delicacy is made. 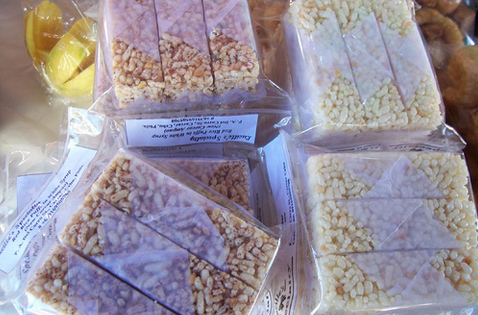 Ampao is the Philippine version of the rice crispies. It began in the early 1900s and became popular in the 1940s. It is just basically cooked rice that is dried out in the sun so that it becomes crispy. Along with this sweet, white treat, you can find a piece of peanut or two. The emphasis of the peanut is to bring out that natural ampao flavor, and helps make it a treat that everyone loves. It would take time to make sweet ampao and is very much unlikely compared to a 15-minute meal by Rachael Ray. Nonetheless, the ampao gives us a more direct taste and also a bit of nostalgic moments that will bring us back a few years ago when we first tasted this delicacy. Ampao can also be found in different colors to attract the younger market. They can vary from green to pink to yellow colors. Children love its colorful and distinct taste and texture. They may also enjoy the lasting after effects of eating colored ampao because it stains your lips and teeth. Ampao is an amazing little treat that you can add to other desserts for a more enjoyable meal. You can put them in your ice cream or on cake. You can make them into little square bars or mix into a batch of cookies. And for true Filipinos, what is halo halo without ampao? No matter how old you are or what dessert you are eating, sweet ampao is a great way to go.